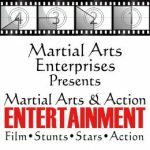 Martial Arts Entertainment has news covering martial arts movies, documentaries, television, radio and theatrical releases and related activities including conventions, seminars and events. Our Who’s Who in the entertainment industry includes stunt performers, action actors, action directors and action choreographers. We offer information about job opportunities, casting calls, and more.